Chicken keeping can get expensive! There is always something else they need and buying everything from the feed store...or even the big box store can get expensive. There is no reason to spend that much money! I buy lots of chicken supplies at the dollar store (I prefer Dollar Tree) Many are the same exact item and others need thrown out and replaced so often that I feel like I'm just throwing money away! Here are 10 things I always buy at the dollar store and why. Also look for.....band-aids, generic vet-wrap style bandages, scrub brushes, shiny wind chimes to deter hawks, ice scrapers to clean up poop boards, plastic tubs and buckets etc etc. Take a look around, I'm sure you'll find something that makes you say "why on earth am I paying more?" 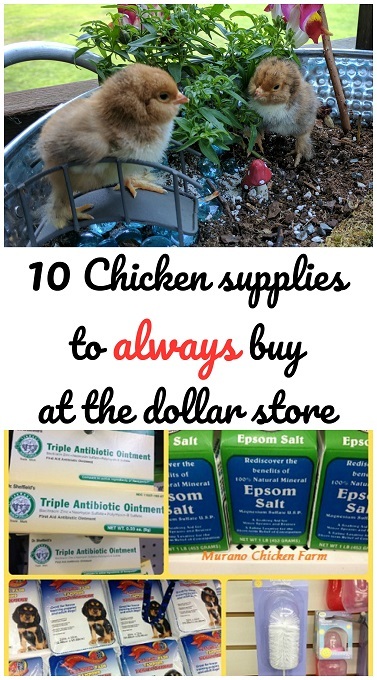 Want more posts on saving money on chickens and supplies? Click here for my other posts on frugal chicken keeping! This is EXCELLENT information!! Thank you for putting this together. It is going on my Pinterest board ASAP! You're welcome...I'm glad you like it! 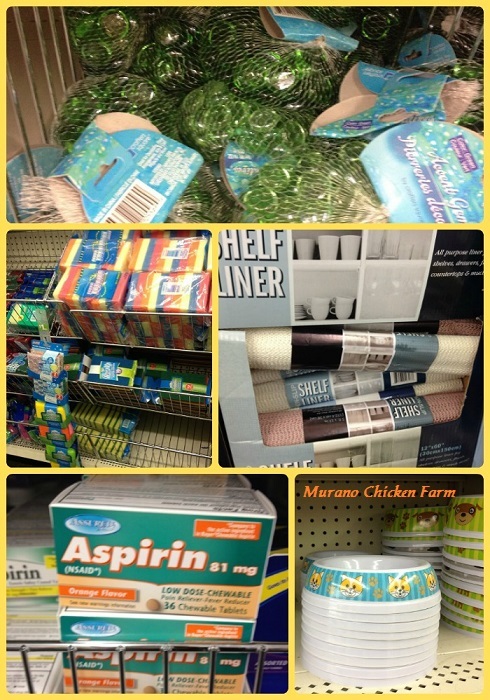 I'm such a dollar store junkie it just made sense to get my chicken supplies there too! I found by tying white plastic bags to the fence around the hen yard the raccoons do not visit. knock on wood. plus it is a very cheap deturant. I have a recipe for pedialyte using sugar, baking soda, water and salt. is that okay? Awesome post! I use almost all these products and never thought to check the dollar store. Sharing at Fresh Eggs Daily now! Thanks! I am constantly looking for ways to make chicken keeping cheaper. Thanks for sharing it! Our hens just turned a year old in March, so there is so much to learn about them and this post has taught me a couple of very useful tactics. Thank you for sharing! I'm glad to help! Chicken keeping is so much fun, isn't it? Thanks for this list! I had never given a thought to look for things at Dollar Tree!!! You're welcome! It's amazing how many things they have that I was paying so much more for. I love a good bargain! This is a great list. We get all we can at the Dollar store. 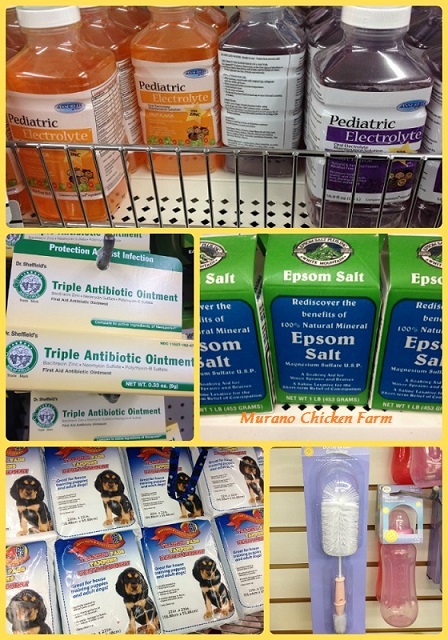 Shop the .88 section in HBA at Walmart--I get 2 pounds of epsom salts there for .88 (baths, gardening, etc.). I looked for an .88 section at Walmart after you posted this and neither of our Walmart's have one! :-( I wonder if it's a regional thing? Glad you found a good bargain! Our stores have them in Southern IL. One has them by pharmacy in a bin like the cheap movies, another has a bin by the checkouts and yet another walmart has them on shelves at pharmacy or checkouts. I'm a big Dollar Tree girl but I do stock up on those. As if I needed another reason to go! I always look for chicken stuff there, but I hadn't heard of bathing a chicken (actually heard it was dangerous to the chicken because of body temp needs) or soaking an egg bound hen. My babies haven't begun laying yet, but this is good to know! I know right? I go to the dollar store wayyy too often! I hadn't ever heard that I shouldn't bathe a chicken. I know bathing is a part of pre-show grooming. I've had to bathe chickens who got pooped on by standing under the roost (if you don't get the poop out of the feathers it ends up pulling the whole clump up feathers out...in Silkies) I always keep the chicken in the house till fully dry and if it's winter I usually keep them in overnight. Thanks for the great info! I was just about to run to the store to get chicken first aid supplies for treating a chicken with bumblefoot, but now I will go to Dollar Tree! Good luck with the bumblefoot! You should find everything you need at Dollar Tree! Thanks so much. I have 5 chickens and have been looking for ways to keep the expense down. What a great idea! I'm sure that she'll love it! Libertymoon...feel free to share it with your customers! THIS IS AWESOME! And very informative! And I do have two chickens in the house...so those puppy pads are going to be very useful Oh don't you know it with the shavings!)! Thank you for posting this!! Exactly! Those pee pads are awesome for house chickens! All my egg baskets came from the dollar store. Plastic coated wire baskets, can be run thru the dishwasher if needed! Thanks for the tip on the baby asprin, our old dog gets one daily. I have some of those too. They work great! Great list of items! I also buy the "brownie pans" at the Dollar Store to use as feed pans. That's a great idea for table scraps! Thanks! This is such a great article. I started raising chickens last year, I want to get a bigger flock going next year (maybe even ducks too!!) So reading this was really helpful! Gotta love the dollar store, I already get my egg baskets there(sometimes the thrift store, even cheaper!) But I didn't think about puppy pads, good idea! Thanks, I'm glad I gave you a few ideas! You gave me an idea now.....I can make a water bowl base with heat using Xmas lights from dollar tree! Look for the post, and thanks for the inspiration! I didn't know that they sold generic pedialyte at the dollar store. I would automatically think of a pharmacy first for that, not to mention the other medical supplies such as baby aspirin. These are good tips for anyone who wants to save more money in their home. You would be surprised at what dollar stores have now! You can really save a lot of money there if you know what to look for. I love shopping at the dollar store!! I recently prepared a lesson for my 4H poultry project kids about having a "poultry prep kit". I bought plastic shoe boxes and made a list of important things to have onhand. 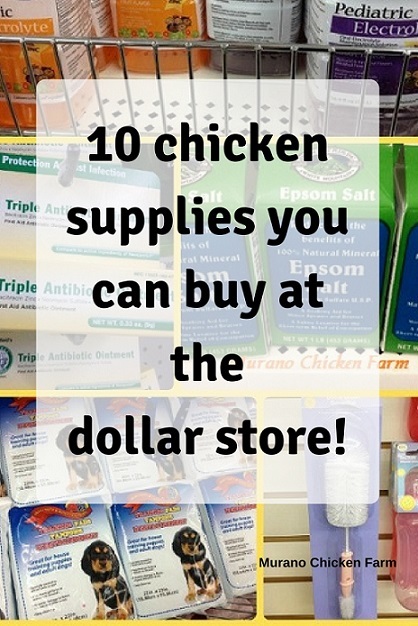 I put together a few items from the list and the kids that answered the lesson question correctly got to get a "poultry prep kit" starter pack a majority of the items from the dollar store!! !! Just a quick note though, if you are buying antibiotic ointment with pain reliever, make sure the pain reliever doesn't have any "caine" in the ingrdients. It is poisonous for chickens. What a great idea! I bet the kids loved that! I usually just avoid the 'pain relief' type of antibiotic cream. I'm always afraid they'll have something in there that isn't clear on the label....or a new medication I'm not sure of....so I just avoid it. I used to think dollar store sell cheap and useless stuff but after reading your article i feel that they could help save quite a few bucks. thanks for the article. I had no idea about these things for a homestead - thank you for sharing at the Tuesday Garden Party! I;m just starting out with Chicks, so this was very helpful! Thank you so much! I use the plastic snack trays for feeders here in the foggy,wet Pacific NW...easy to clean too! Beside your list here, I buy all my spices at the Dollar store and use them liberally in feeding my flock. Chili Spice, chili pepper flakes, cayenne pepper, oregano, paprika, basil, etc... I used these to worm my turkeys every month whether they need it or not. Turkey are too hard on plastic ware, so I have to use the metal bowls. Also you should consider using plastic garbage cans to hold their feed in before you are overrun with mice and other critters.